Aprelium - Abyss Web Server X1 version 1.2 Beta 1 is ready! We, at Aprelium Technologies, are proud to announce the availability of the first beta release of Abyss Web Server X1 version 1.2. This version includes many significant technical improvements and inaugurates the MacOS X and FreeBSD ports. We have pushed the limits and made Abyss Web Server require less memory. This gain in resources is better seen on Windows where the software uses about 1MB with a typical configuration. To test this feature, browse http://yoursite/_killme_. For security reasons, this special URL is only reachable from your local computer or other computers on your LAN. It will be removed from the final release. Many people kept asking us if there will be a Macintosh or a FreeBSD version of Abyss Web Server. So we decided to port our software to both these platforms. The Macintosh version was designed to take into account all the specificities of MacOS X and to perfectly integrate with this system. 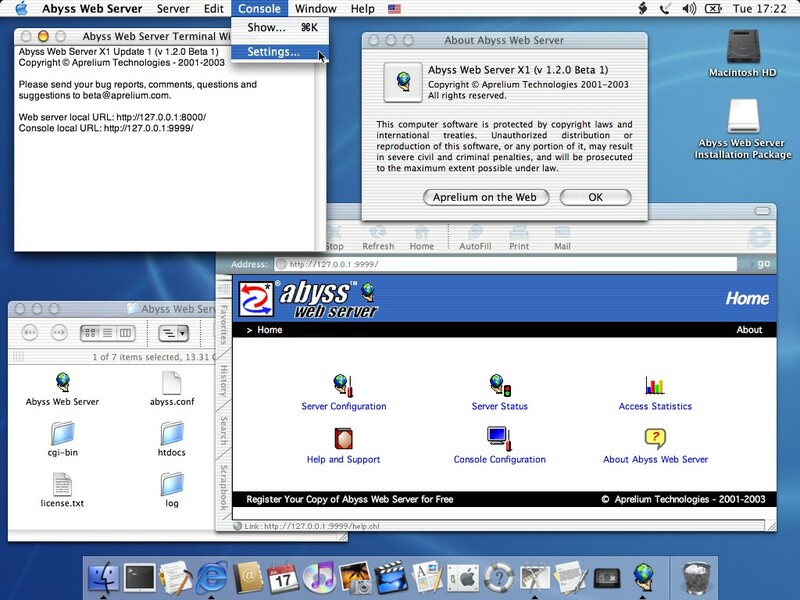 Click on the image below to see a full-size screenshot of Abyss Web Server running on MacOS X.
Download Abyss Web Server X1 version 1.2 Beta 1 for Windows (140 KB) and execute it to start the installation. Download Abyss Web Server X1 version 1.2 Beta 1 for Linux (113 KB) and execute the command tar xzfm abwsx1.tgz to uncompress the package. 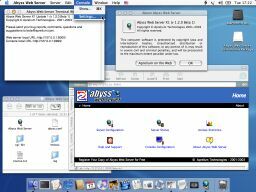 Download Abyss Web Server X1 version 1.2 Beta 1 for MacOS X (211 KB), double-click on the downloaded file to open the package, and read the Installation Instructions file. Download Abyss Web Server X1 version 1.2 Beta 1 for FreeBSD (113 KB) execute the command tar xzfm abwsx1.tgz to uncompress the package. To upgrade from the previous version, download Abyss Web Server 1.2 Beta 1 for Windows and run the installer. It will detect the presence of an older version and will ask you to uninstall it. Once the old version removed, the installer will setup the new version.